Large - $29.99 Only 1 left! Haven’t you always been fascinated by that classic bit in spy movies where an important dignitary slips into a bathroom, looks in the mirror and begins to peel off his face to reveal that he’s really a secret agent wearing an elaborate, lifelike mask? If you’re anything like us, that’s always made you wish it was really that easy to adopt a brand new identity. 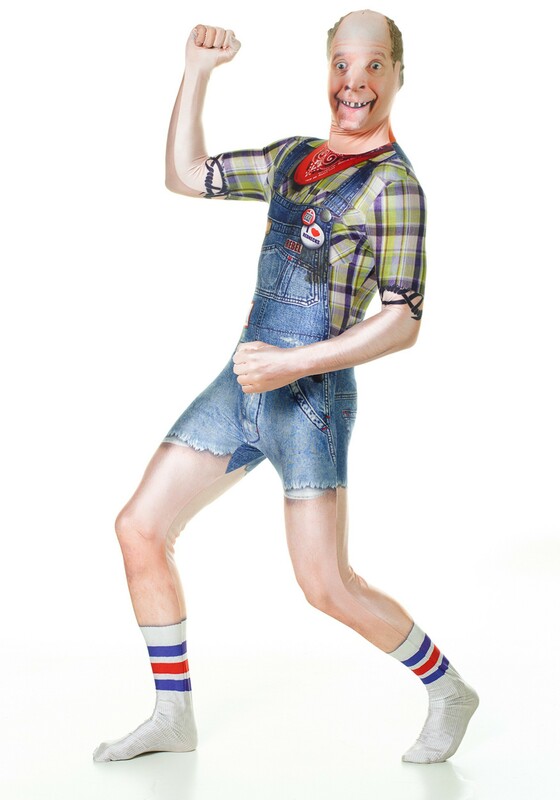 If only you could just pull on a mask and become a foreign ambassador, or a famous academic, or… a countrified weirdo in short-pants overalls? We can’t do much for you on the first two fantasies, but we can help you make a stab at the third. A full-body morphsuit may not be quite as foolproof as secret agent style mask technology, but it will certainly confuse and probably unsettle a lot of folks. 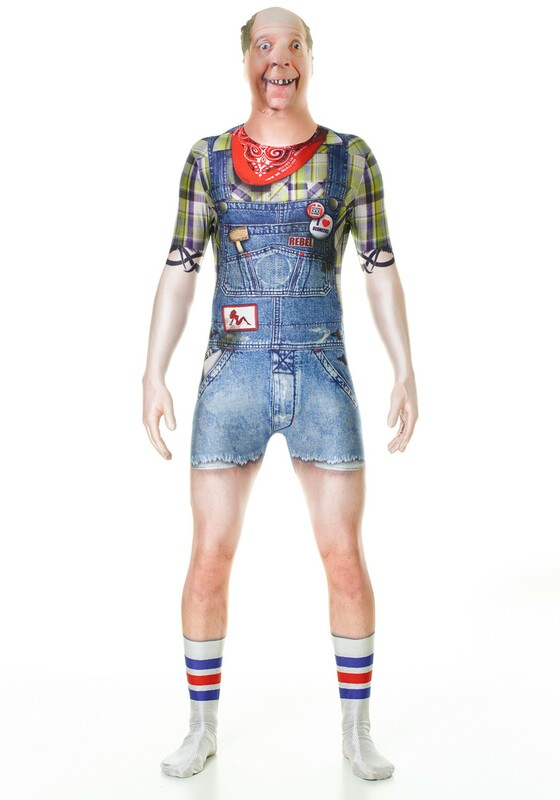 This gentleman in particular looks like the life of a party you’d do well to stay away from, ready for a night on the town (likely unincorporated) in his dressiest bibs, complete with bandana, rolled-up flannel, and tube socks (no shoes, thank you very much) for an added touch of class. Even if you don’t quite fool your friends into thinking you’re a whole different person, you’ll give them plenty to talk about in this polyester/spandex blend faux real morphsuit. The form-fitting fabric covers your entire body, with head, hands, and feet fully enclosed. (Don’t worry, there’s a two-way zipper at the back for an easy exit.) We’ll grant that it’s not quite the same as sliding into another identity with the aid of high tech spy gear, but it’s… well, it’s definitely something.